There are a some striking images coming out of today's May Day protests, but this must be the most absurd. It's is a picture of self-declared 'citizen superhero' Phoenix Jones and his sidekick at Seattle's May Day protests, which have at times erupted in violence. 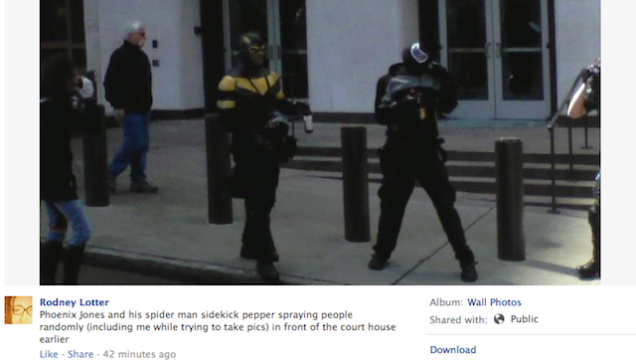 Phoenix Jones has been wandering around Seattle today, allegedly dousing protesters with a comically large bottle of pepper spray. I ran into Slog commenter Baconcat, who was pepper sprayed by Phoenix Jones. Baconcat was taking pictures at the courthouse and Phoenix was screaming at the group, 'I'm not against you guys, I'm here to keep the peace and protect this historic building,' and then took them out with pepper spray. Baconcat says his eyes are dry as hell. Unexpectedly blasting people with burning pepper juice in the eyes? Worst super power ever. He's like Batman combined with a mall cop. But we do know Jones is pepper spray happy, having previously arrested for pepper spraying people he said were fighting, but cops said were dancing. This is all further proof that Seattle is not a real city but the fleeting dream of a stoned Orca Whale floating somewhere in the Puget Sound.